Mancini: Pondering the use of 8 defenders? It’s a strange notion that a team, lying third in the table, can be “too negative” to win the league title. Rather than shortcomings of ability or mental strength, pundits have sought to cite Manchester City’s, and in particular manager Roberto Mancini’s, negative tactics as the reason they won’t be crowned league champions in May. Saying a team is “too negative” is odd because it implies there is a correct approach to tactics. Of course the extremes, such as keeping all your players on your goal line or in the opposition penalty box (which normally leads to ‘quit game’ on Football Manager), are not particular clever or effective, but then again no manager would ever reach anywhere near the top levels of the game employing such policies. The accusation is mainly levelled at Man City in big matches, where fans and pundits have grown frustrated at 0-0 draws this season away at Spurs and Arsenal and at home to Man United. Before Saturday’s lunchtime kick off with Man United, Sky Sports’ Paul Merson urged Mancini to adopt a more positive approach in his pre-match blog. Before I look at some of the stereotypes and myths the former Arsenal midfielder churns out, it’s worth remembering that he was trying to promote a match for his employers. At the same time, his opinions are worth considering. I don’t intend to use the benefit of hindsight with regards to the United match – this is a more general look at Manchester City’s perceived negativity. They have to play two up front and I think Man City fans will be disappointed if they go there negative. United are always likely to create some chances, so you might as well take the game to them… If City play a 4-5-1 then they won’t pose too much of a threat. Playing two up front in general would represent a change for Mancini, who has favoured playing the sole striker this season, typically Carlos Tevez. But in the space of a few words, the Sky Sports pundit has struck at the core of two misnomers that riddle English football; that playing two up front is more positive, and that 4-5-1 is negative. For the time being, we’ll assume Merson’s 4-5-1 means a team with one orthodox striker and 5 players typically classified as midfielders, whilst a 4-4-2 implies 2 strikers and 4 midfielders. By Merson’s definition, and from many throwaway comments heard in pubs and on terraces, the side that plays 4-4-2 should create more, score more and take the game to a team playing 4-5-1. As evidenced in Liverpool’s 3-0 defeat to Manchester City in August (a result conveniently overlooked by many pundits), this isn’t necessarily the case at all. As the linked analysis succinctly summarises, Liverpool’s central two midfielders were completely controlled by Manchester City’s central three. City could dominate possession, play triangles around Liverpool, and feed Carlos Tevez in for two goals, one of them from the spot. Certainly today the term ‘4-5-1’ is so vague as to be almost useless to describe how a team lines up on the field. It is rather a generic term, describing a family of formations. In England, to describe a team as playing a 4-5-1 is a backhanded way of implying they are playing defensive. No one, however, calls Arsene Wenger’s Arsenal defensive, and yet as this analysis shows, they set up in exactly the same way as Man City in their 0-0 draw at the Emirates in January. To reiterate, formations are neutral. 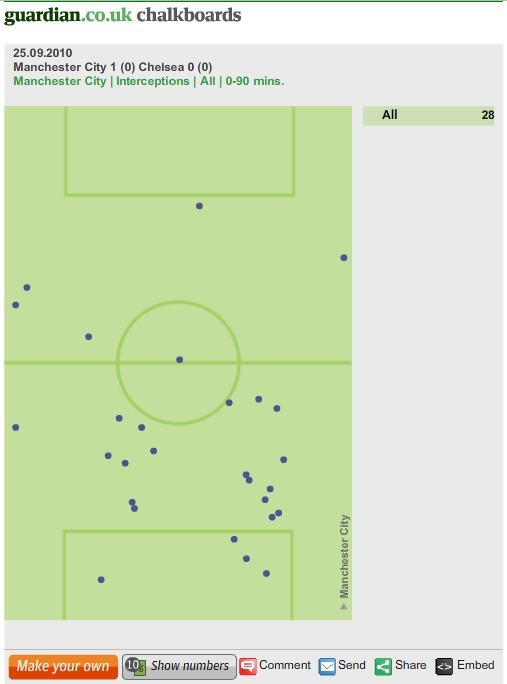 Arsenal employed a 4-2-3-1 a few days earlier at home to Chelsea, but unlike Man City at the Emirates, pressed their opponents relentlessly, often winning the ball around halfway to spring quicker attacks. Mancini’s tactics (sit back, play on break) again got the better of Chelsea, who looked toothless when behind. City were compact and able to link up seamlessly. Certainly nothing wrong with winning. “He’s Italian,” bemoaned Gary Lineker after the game. Roberto Mancini, that is. Lineker, obviously, is not the only person to have bought into the idea that Italian football is inherently cautious. It is a stereotype which endures from the 1960s heyday of catenaccio, and it is, as with all cliches, based partially in truth. Done well, catenaccio, quite literally, closes the door and bolts it shut. That is not to say that Herrera’s Inter or Rocco’s Milan were not capable of great artistry when going forward. Inter won the 1965 European Cup final 1-0 with a team which included Jair, Sandro Mazzola and Luis Suarez, all fine attacking players. Such a stereotype misleads. The Premier League, it is fair to say, enjoys a certain tactical uniformity. Most sides play a 4-4-2 – which, as everyone in England knows, is the correct formation – or, possibly, the old 4-5-1 which becomes a 4-3-3 in attack (except that it doesn’t, it’s still a 4-5-1, the players are just standing in different positions). A few renegades play a 4-2-3-1, which is just a 4-5-1 with an attacking midfielder. It was at Roma that Luciano Spalletti first experimented with the 4-6-0 formation which Sir Alex Ferguson has tried to implement at Old Trafford. It sounds defensive, but it really isn’t. It is fluid, and reliant on players of great technical ability. It is in Italy, too, that the role of the trequartista was perfected. Teams continue to find room for a playmaker, freed from defensive responsibility, who is tasked with infusing their play with a dash of imagination. It was the position which gave the world Gianfranco Zola, Roberto Baggio, Alessandro Del Piero, Francesco Totti and that lad at Sampdoria, the one who went to Lazio, had a spell at Leicester. Oh, yes. 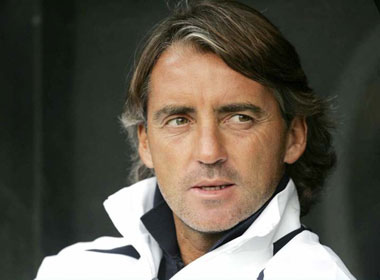 Roberto Mancini. The closest the Premier League has are Steven Gerrard and Wayne Rooney, and we still struggle to think of them as anything other than a midfielder and a striker. Small wonder, when a player as imaginative, as gifted as Mancini comes to coach in England and we naturally assume he must be defensively-minded, just because he’s Italian. Italy, that nation with 26 European Cup finalists to England’s 17, with 8 major tournament finals to England’s 1 (any guesses which year?). That country that never wins anything because it’s just far “too negative”. Even if they come away losing 3-2 at least they’d have tried. That’s got to be better than drawing 0-0 for the umpteenth time this season. Whilst it’s no doubt a feeble attempt to goad Man City into playing positive football for the good of Sky Sports’ big weekend kick-off, it’s a comment that is utterly crazy, and not one you’d expect of someone voicing his opinions to millions of viewers. Losing better than drawing? That’s what Man City have been missing – with the loss at Old Trafford, they’re certainly en route to the league title now! Both sides played two up front, which you think might be negative. Both sides played with a solitary striker, did that surprise you, it’s a little on the negative side, fear of losing a derby? I wasn’t able to watch the match, but these comments strike at the ignorance that forms a huge part of the ‘expert opinions’ we see on our television screens. More Rory Smiths, please. Inclined to disagree a little here. Even though I agree with the fact that 4-5-1 or 4-2-3-1 should not naturally be seen as negative, I really think that in City’s case it is. Arsenal, United, Chelsea (to an extent pre-Torres) and Liverpool, the top 4 teams prior to a couple of seasons ago, all played this formation in an attacking sense with huge importance on the playmaker position. Fabregas, Nasri, Gerrard, Lampard and Rooney (slightly different I know as with him its more off the main striker) have played in that playmaker position and the two wingers are also always attacking choices with Nani, Malouda, Walcott, Arshavin and Anelka some obvious examples. City have played Yaya Toure in the playmaker position, a player who is no more than a defensive midfielder who’s main skill is to break up play, when they could have quite easily played Tevez or David Silva there and out wide have opted for players such as Kolarov or Milner to a lesser extent, when Adam Johnson has sat on the bench, alongisde notable strikers such as Adebayor or more recently Dzeko. Furthermore, one of the two ‘defensive midfielders’ is usually a ball-player – Wilshere and Scholes spring to mind, but again with Barry and De Jong, this is not the case. It seems to me that it is not the formations we should be talking about, but more the personnel, and in this respect City fall short. If Tevez were to play in behind Dzeko, or Silva in behind with attacking wingers like Johnson it would be a different story. Their performances away at Arsenal and at home to United were shocking and I’m sorry, but no team with such a lack of ambition will win the title, which with the money Mancini has been given, should surely be City’s aim. I see your points. Perhaps the heading is a little misleading – Man City are negative in the sense that they can and have invited pressure in big matches, shown by their level of pressing. It can still be effective though, as shown against Chelsea, and securing draws at the Emirates and White Hart Lane aren’t bad results when you consider both Chelsea and United drew at WHL and Chelsea lost at Arsenal. Those teams set up and got worse results than they hoped – maybe doing it Man City’s way is better, if not in the style of English football. Their negativity is not, however, from the fact they play 1 up front, which is suggested in many sections of the media (see Merson, Hansen, Lineker). That is more the point I’m gearing towards, and I can see why it isn’t totally apparent in the post. I totally agree on personnel and how they should set up if they want to exploit the benefits from the Anchorman-ball player-playmaker trio that so many teams have used they need to sign someone who can play as a Gerrard/Kaka/Iniesta, or rejig as you suggest. I think they see Barry as their ball-player, certainly Liverpool did when they tried to replace Alonso with the Englishman. City haven’t been all that negative in other matches this season, they’ve only failed to score against Villa, Sunderland and B’ham this season in non-big games, all away from home, which isn’t bad going for a bunch of players that haven’t been playing together for a number of seasons like their other title contenders. Perfectly valid reply! I agree that their negativity does not stem from playing 1 up front and I think that is made very clear in the blog. Barry for me is not a ball-player – he was over-hyped due to the World Cup debacle and for me is a pretty standard player but one certainly not with the same ball-playing skills as Alonso or Scholes, though certainly better defensive skills than the latter. As always, you hit me with a stat that makes me look silly but I can only presume that this is due to how good Tevez has been. Without his goals, where would they have been? They have relied on him very heavily but I suppose no more so than United did on Rooney last year or maybe even Chelsea with Drogba in previous seasons. Absolutely stunning, look at all those accurate long passes. Wears a team out more than anything else, shifting play right to left, whereas the little 5-yard square passes Lucas used to play a lot of did nothing. Best stay away from Scholes’ tackle chalkboard though, I imagine. Quick correction – the match where Birmingham drew 0-0 with Man City was at the City of Manchester Stadium, not St. Andrews. However the main point is spot on 1 up front does not make a team negative, formation does not equal tactics. And it is possible for teams to be rather negative in a 4-4-2, for example, sitting relatively deep, defending in 2 banks of 4, and hitting on the counter attack using pace for example. Couldn’t put it better myself. And thanks for the correction, my mistake! Hello Omar, I have been reading your blog for a while & I’ve enjoyed it. This article, including ‘Jack Wilshere’s misunderstood talent’ & ‘Directness still key to Coyle’s Bolton’ are my favs. I’m a favorite of the 4-5-1 because it’s an attempt to win possession, however, seeing Tottenham use the formation didn’t suit me at first. Spurs are 4-4-2 team that has include striking partnership such as Berbatov-Keane, Sheringham-Klinsmann, & Kanoute-Defoe (been a fan since ’91). Yes, 4-4-2 does seem attacking. Since playing in the Champions League where this formation is deemed more continental & suited, than playing 4-4-2 & conceding three goals against Young Boys in the 1st half. But with strikers struggling to score, & sometimes I feel ‘must play van der Vaart’ from Redknapp, the formation continues. Fortunately, the performance against Man City, Liverpool, & Chelsea, show that Spurs are becoming more of a ‘possession team’ this season, especially with Modric controlling things. Even though the number of chances on goal has decreased & the results against the oppositions I mentioned are varied, but by maintaining possession, Spurs are keeping the ball away from the opposition, & that means, less time for opposition to score.